2) Recently there was a facebook meme where many people were encouraging their friends to change their facebook picture to a cartoon character from their past “to help child abuse.” I noticed several friends of P’s changed their profile picture to characters from Barbapapa. So if you are like me, perhaps you didn’t have Barbapapa in your childhood, and might have no idea what I am talking about. But Barbapapa seems to be a beloved character from the childhoods of many a Nepali I know. So what is Barbapapa? According to Wikipedia (my favorite website of all time) it is both a title character and the name of the “species” of said character from a series of French children’s books written in the 1970s by Annette Tison and Talus Taylor. (barbe à papa is French for “cotton candy”). The books were later translated into 30 languages, and the cartoons became quite popular particularly in many Asian countries. P’s brother U in particular has shared the Barbapapa love with me before, so if you want to learn a little bit more about your significant other’s childhood, maybe see if he or she has any Barbapapa memories they might like to share. What is their favorite Barbapapa character? D left on Saturday to go to Nepal for a few weeks, and N’s mother (Aunty) has been visiting and thinking about gifts to bring home, so recently shopping trips have been on the rise. Such as two weekends ago when the six of us (Aunty, N, AS, P, me and D) decided to go to an outlet mall near by. As we rummaged through some shops AS, N and Aunty were telling me that they have to be careful what gifts they buy because people back home are very conscious about where products are made. 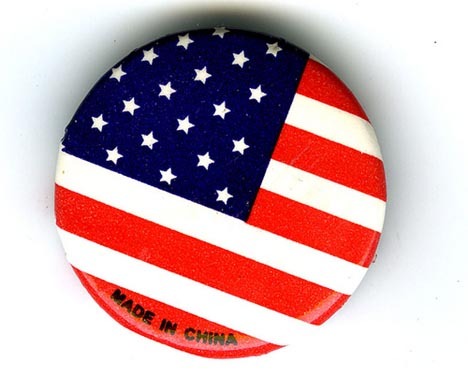 In the US a lot of our products are made in China. Most Americans are used to that, we don’t really think a lot about our manufactured goods. Factory made products are so ubiquitous that I really appreciate unique handmade, handcrafted products, and love to bring handicrafts back from my travels. In Nepal (and many other parts of the developing world) labor is cheap, and handmade products are everywhere. People are more interested in manufactured goods, but they pay attention to the label. If you bring a manufactured good from the US, they want to see something “Made in the USA” or at least from a country far away like Nicaragua. Bringing products back from the US with “Made in China,” “Made in India,” or “Made in Bangladesh” doesn’t seem to make sense, since these countries are close by, and many of the products in Nepal are also made in these countries. I never really thought about that before. Granted—often times products available in the US are of a different quality than the products available in other countries, even if they were made in the same place. For example, in Kenya, which is a big tea producing country, locals are not able to buy the best quality tea grown by their own countrymen because everything above a certain quality is exported. However I understand the disappointment of getting a gift “from the West” only to find out it was actually “Made in China” when your country borders China. Food for thought the next time I buy a gift to send to Nepal! I know, I know, I have probably beaten this topic to death, but it never ceases to amaze me. N’s mother is staying with us for a little while, and unfortunately while visiting us her elder brother passed away back in Nepal. There was an article about it in one of the Nepali daily newspapers, and word had filtered out. So a few people have been calling her to make sure she is okay and offer their condolences. One such person was none other than Jyoti Pathak, the author of the Nepali cookbook I reviewed a while back. “Really? The author?” I asked, a bit surprised. Why am I still surprised? Another such example from the blog– a while ago I posted a documentary on “Birth in Rural Nepal.” While one of the blog readers was watching the video with her boyfriend he looked at the screen and said, “Hey, [the film maker] is my cousin-sister! I remember she said she was working on something for aljazeera”. The first is called “Nava Durga: Nine incarnations of the Mighty Devi Durga” and discusses the different incarnations of Durga (the power goddess) that are worshiped on different days of Dashain. The second article was on Dashain tikkas and why some communities use red versus white or black. (From the Republica article on Tikka): This picture illustrates to those who have never seen or participated in a Dashain tikka giving what it looks like. An older member of your family/community gives tikka and blessing to younger people. Note the jamara grass tucked behind the father's ear. In the “white tikka” section of the article it discusses how different ethnic communities sometimes choose to use different colored tikkas to differentiate themselves and their practices, since historically red vermillion was not readily available outside of the KTM valley, and tikkas were created with butter (potentially influenced by Tibet), or curd and rice. Also the article gives the example of the Limbu people, whose participation in Dashain can only be traced back to Rana Bahadur Shah’s reign. This reminded me of a story that M-dai told me a while back. M-dai is from the Sunwar ethnic group traditionally from the mountains in the Solokhumbu region of Nepal. Many of the mountain people were not traditionally (and many still are not) Hindu, but Buddhist or animist/shamanistic. When Nepal became unified under a king, and the country was declared a Hindu kingdom, advisors of the king were sent to the more remote areas of Nepal to enforce Hinduization. M-dai said his grandfather’s grandfathers used to have to show that they sacrificed a goat for Dashain to prove their participation in the Hindu festival and their adherence to the king. For some families celebration of this festival may have stuck, but not for all. Which leads me into the final article: “Commentary: On Not Celebrating Dashain.” Even though to me Dashain feels more cultural than spiritual, it is important to remember that the festival– much like Christmas (regardless of how secular and commercial it might seem to some) in the US– is not celebrated by everyone. This article is from the perspective of a Nepali who is not Hindu, and thus doesn’t celebrate. I hope you don’t mind all the posts on Dashain… it’s just on my brain as of late. Thought others might find these interesting….